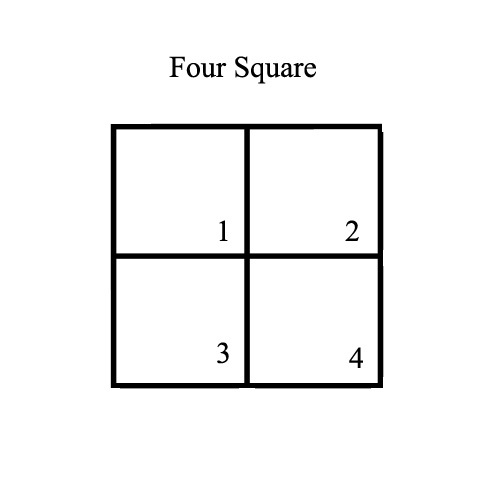 Four-square is a fun game to play outside. Kids really enjoy this one. I should note that it is good to have an adult involved, especially when you have a very competitive group of kids. The adult can play or act as a referee. You need at least 4 players; you can have more than four. Each player gets in a square, those that can't go into a square line up behind square 4. The player in square one serves the ball; when you serve you always have to serve it to the player in square 4. Serve the ball by bouncing it in your square and then hitting it into another square. You're safe if the ball lands in another square or if someone hits it before it bounces into a square. Return the ball any time it bounces in your square, by hitting it and bounce it into another square. If it bounces in your square after you are out and move to the end of the line. If your ball goes out of the squares you are out and move to the end of the line. If the ball goes into your square and bounces more than once or out of your square before you hit it, and move to the end of the line. If you bounce the ball too hard (called a cherry-bomb) you are out and move to the back of the line. Everyone else moves up a square when a player moves to the back of the line. You win the game when you remain in the first square without going out the longest.